Having to frequently take reading glasses on and off is inconvenient for many people. Because of this, a person might wear reading glasses around their neck, scatter multiple pairs around the house or wear bifocals all the time. With today’s advanced lens procedures, patients now have a choice in the type of lens that is implanted during cataract or clear lens extraction surgery. Unlike conventional”single vision” intraocular lenses (IOLs), multifocal IOLs are lens implants that are designed to help patients see at varying distances using different points of focus. The goal of a multifocal IOL is to provide functional vision at different distances to minimize the use of glasses. Although they might still prefer to wear glasses for prolonged reading, the vast majority of multifocal IOL patients experience freedom from glasses for tasks such as driving, watching TV, using their cell phone and computer, looking at photos, reading magazines, price tags, product labels, receipts, and menus. How Does a Multifocal IOL Work? With bifocal glasses, you look through the top part of the lens for distance and through the bottom area of the lens for near. A multifocal IOL, designed using advanced technology called diffractive and refractive optics, is entirely different, providing both a distance and near focus at all times. Your brain will learn to automatically select the focus that is appropriate for the task at hand. This phenomenon is much like having a conversation in a room where there is background music; the brain will “tune out” one to listen to the other. There is a learning curve for using this new, advanced optical design. For example, patients often will have to learn the optimal distance or “sweet spot” for holding reading material as it will likely differ from what the patient was used to before surgery. Depending on pupil size, the multifocal IOL patient may experience some halos, or rings around lights at night. These halos are different from and less problematic than those typically caused by cataracts. Fortunately, these halos become less noticeable and distracting over time as the brain learns to selectively ignore them through a process called neuroadaptation. This is the same process that allows us to ignore background noise such as traffic sounds or an air conditioning fan. How quickly these adjustments are made by the brain varies for different individuals. Experience has shown that neuroadaptation is a gradual process that occurs over several months. Halos are often quite noticeable during the first 24 hours after surgery when the pupil is still dilated from medication. Do not be alarmed or misled by this temporary situation. 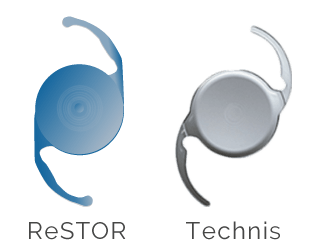 Compared to their predecessors, the current generation multifocal IOLs have been engineered to significantly reduce the halo effect. Will I Need Additional Procedures to Achieve the Best Result? Much like contact lenses or glasses, a multifocal IOL comes in more than 60 different “powers”. As with prescription eyeglasses or contact lenses, it is important to match the appropriate IOL power to your eye. When prescribing eyeglasses or contact lenses, we utilize trial and error to preview different lens powers to determine which one you see best with (“Which one is better, one or two?”). However, because the multifocal IOL is implanted inside the eye, and only after your natural lens (cataract) has been removed, it is impossible for you to “preview” various IOL powers prior to surgery. Furthermore, once it is implanted we cannot as easily exchange the IOL as we could with glasses or contact lenses. Fortunately, an appropriate IOL power can be estimated using advanced mathematical formulas based on pre-operative measurements of your eye’s dimensions. Although these formulas are quite accurate in most patients, there are individual variables that prevent this process from being 100% perfect. In particular, individuals who are extremely nearsighted, farsighted, or have high amounts of astigmatism, and patients who have had previous refractive surgery (e.g. RK, PRK, LASIK), are more likely to end up with an IOL power that is not optimal because the mathematical formulas are based on average sized eyes, not extremes or eyes that have had previous surgery. Multifocal IOLs are high performance devices and, accordingly, require precisely tuned optics. If the IOL power is not optimal, the multifocal IOL will not perform as well as desired. In these situations, a patient may discover the vision is adequate for most tasks and that wearing a very thin pair of glasses helps them out in certain situations (e.g. night driving). Alternatively, an additional procedure, such as LASIK or PRK, can be performed to optimize the outcome. There is a 15 to 20% chance that a secondary procedure like LASIK will be necessary to fine tune the spectacle free vision. Please refer to the FAQs about Multifocal IOLs to learn more specifics. The alternative to a multifocal lens would be a monofocal IOL or an accommodative IOL. A patient who chooses a monofocal (conventional single vision) IOL must be aware that glasses for near vision will be necessary. To reduce dependence on glasses for near vision tasks, monovision correction with monofocal IOLs is also an option. Monovision correction is a technique that makes use of the fact we have two eyes. In this technique, one eye is set for distance vision while the other is set for near vision. After an adjustment period which usually lasts several weeks, the brain neuroadapts to this new optical arrangement, allowing the patient to see far and near seamlessly. This monovision arrangement is often used in patients who wear contact lenses full time and who are over the age of 45. Monovision may not be the best choice for all patients.